Many American students have a difficult time adjusting to life after high school. However, the difficulties and obstacles would only be more amplified if one were to travel abroad. Linfield is known among the community and internationally as a great option regarding study abroad both for American students, and those looking to study in the United States. As a result, we receive a plethora of study abroad students each year. When interviewing three students about their experience in the United States so far, there was a collective consensus that Linfield has provided a warm and welcoming experience, one that will not be forgotten or overlooked. Isis Hatcher, an international peer mentor, works closely with the international students ensuring they always have a friend or someone who they can talk to. “It’s a lot of just getting to know people on a more personal level. Which is super interesting,” Hatcher says. Further, it is a priority of hers to make sure the international students are connected with the Linfield and McMinnville community. She has gotten the feeling from some of her students that their expectations might have been let down. “They had high expectations for what their experience would be like in America based of of media and what people told them. They didn’t factor in that the experience isn’t just going to come to you you have to seek it out,” Hatcher said. Having heard this from her mentees, Hatcher is working closely with other Linfield students trying to connect them with international students who have similar things in common as an attempt to further incorporate them into the Wildcat community. Overall, Hatcher shares that she has a lot of interesting conversations about cultural differences with her students. “Pretty early in the year I asked a Japanese girl what the hardest thing is being in America, and she said learning to have your own opinion,” Hatcher then helped this student learn how to have an opinion and effectively communicate it to others. The following is a spotlight on a day in the lives of some of our international students. Think of it as a diary. What they are thinking, how they are feeling and a little background on the process of coming here. Eduardo Vargas, from Bolivia, says he is extremely excited to be in the United States because there is an abundance of opportunities for him to learn new things and improve as a person here. As with many international experiences, he has experienced a culture shock when interacting with people more accustomed to American culture. “I feel uncomfortable because many American people are more private showing less emotions.” It is more accustomed in Latin America for Vargas to stand closer to people during conversations, or perhaps to hug when saying goodbye. In addition, he finds subtle cultural differences when sharing things with his roomate. Vargas does not mind sharing, “what’s mine is yours” he says. However, he sometimes forgets that asking permission is an essential part of maintaining a healthy roommate relationship in United States . Like many students, Vargas misses food from home. He noticed a lacking of organic food here in the United states in contrast to his home country. On the positive side, Vargas feels as if he is more independant here in the states, “I feel more like an adult.” He is learning how to do new things for himself everyday. In Bolivia, a college education means hardly nothing because it is common knowledge that their colleges do not provide a solid education. Thus, Vargas is extremely excited to be here in the United States receiving a more valuable education than he would in his own country. “There are more opportunities for success,” Vargas said. In fact, the college experience is one that Vargas feels most passionate about. “I feel that here we have more homework than Bolivia, we have more activities, and we have more opportunities to [have] fun,” Vargas said. Vargas feels most productive and happy in the mornings. He often wakes up early in the morning and plays spanish music. “But sometimes english music, for my roommate,” he said. In the afternoon he volunteers his time at the McMinnville elementary school serving them lunch and helping in the classroom. He enjoys working and interacting with the kids. Vargas said he is having a great time in the United States. However, similar to many American students, he misses home. “It is difficult because there are all my friends, all my family, all my memories in Bolivia.” Unlike most students at Linfield, Vargas cannot drive home on the weekend for a home cooked meal and some quality family time, he has to wait 6 months until he can fly home. However, Vargas is able to talk to his family on the phone from time to time which he says helps. Jingzhi Wang is an international student from China. He has also had an extremely positive experience at Linfield so far, and in the United States in general. He chose Linfield for the smaller environment. He believes, like many students at Linfield, through the small environment he will be able to form more intimate relationships with people. Overall, Wang is enthusiastic about coming to the United States because he believes there are better opportunities for him here. “American education is the best in the world,” Wang said. The education he receives here will hopefully provide him with a more well rounded perspective on life. He wants to try every new thing, and has an extremely open mind when it comes to American culture. Not only will his academic skills improve while at Linfield, but so will his social skills. Wang has leaped into the social scene at Linfield feet first. “I can improve myself because it’s a new environment. New cultures and new friends.” He noticed a warmer, more friendly environment here compared to China where they are more serious and focused. Wang also had interesting critiques on American cuisine. He noted that while our food may be spicy (which he likes) it is not flavorful. In China, Wang can get food that has both intense spice and wonderful flavors. The best of both worlds. In fact, Wang’s home town of Chengdu is where the American favorite Panda Express originated. One unfortunate difference that he has experienced while living in United States is the lack of a reliable transportation system “You want everyone to drive a car in America,” he says. Due to the lack of public transportation Wang finds it hard to get around at times. As far as classes go, Wang says his classes are slightly difficult and he is learning very quickly that time management is important to succeed as a college student. This realization is happening for many first year college students as well. His favorite activity is community service. Wang volunteers at the McMinnville library and enjoys the interaction with the community and the overall atmosphere. In addition, it is a great chance for him to practice his english. Finally, Wang finds American conversation to be extremely interesting. He has found knowledge of sports and intramurals is a great way to make friends and get involved with other students on campus. Sports are often a common ground for American students. For example, two people may only connect through the fact that they both know who won the World Cup this year (it was France). Wang explains that in China computer games are popular and sports games are more popular here. He is in love with the attitude shift he has experienced in the United States. Sidra Khalid, and international student from Pakistan, is only here for one semester, but she is determined to pack as much into this semester as possible. 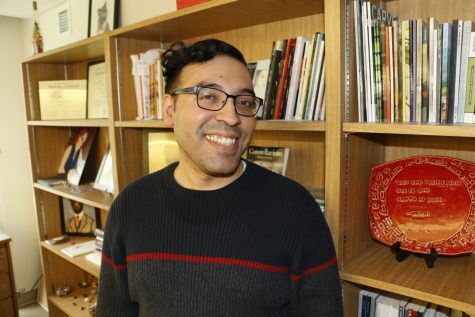 Khalid is involved in RHA, and actively participates in Linfield’s art community. Khalid chose the United States because “I believe that America is so culturally rich.” She loves that she is surrounded by so many cultures because it only enhances her experience as an international student. When it comes to culture shock, Khalid believes that she has not experienced it as extremely as others because she spent a lot of time watching Hollywood movies and learning about American culture through that. However, there are subtle cultural differences that she experiences on a daily basis specifically when it comes to sharing a living space with another person. In addition, she recently visited California and felt the culture there was extremely different from that in Oregon. “If there are 50 states there are 50 countries,” Khalid says with admiration. As an art major, Khalid is extremely glad to be in Oregon because of the natural beauty the state has to offer. In her interview, Khalid addressed the stigma around Muslims in America. Rather than being scared of discrimination, she found herself challenged to come and debunk stereotypes surrounding the Muslim community. “I really wanted to realize that what you see in the media [about Muslims] is not the truth. I wanted to see if Muslims are really hated [in America]. I have not met a single person who mistreated me because I am a Muslim. So I guess that’s one stereotype down,” Khalid says. In fact, part of her scholarship and the reason she is here is to improve the relationship between Pakistan and America. The scholarship program she is a part of was formed by the Department of State in Washington D.C.
“The scholarship was built because we actually want to build relationships with America. We are cultural ambassadors,” Khalid says. Khalid wants to recognize her sponsor IREX for allowing her to have this opportunity to come here. She is so happy for this opportunity and enjoying every second. Also, Khalid is thankful to have been learning English her whole life because it makes life as an exchange student much easier. She has been studying english since childhood. It can be hard for international students to reach out to American students, just as it can be hard for American students to reach out to international students. However, college is about meeting people from different backgrounds and learning from what they have to offer. Keep this in mind when eating at Dillan, sipping coffee at Starbucks, or even just walking to class. Help strengthen the Linfield community by talking to someone new.